Website Localization, Website Translation, Hong Kong Localization, China Localization, Taiwan, CMS, HTML, Web-Based System. Chinese-Version helps you with the localization process to maximize market share in your target country. We help you localize your manuals, marketing materials, branding, software interface, and website for specific languages and countries. Our language localization tools can extract the text from your HTML or software files without touching the code. Translation is carried out and reinserted into the program or file. This facilitates content management, even when working with multiple languages. 20.71% people in the world speak Chinese, the most common language. with the highest Population. With the incessant rapid growth of economy, purchasing power in China is far over western's expectation. According to the statistic data from internetworldstats.com, in 2005 Chinese is the 2nd popular language on the internet. As the penetration of Chinese speakers is only 8.6% which is far less than other languages, it is obvious Chinese will be the major internet language in the coming future. Due to the big population of Chinese internet user, localizing your website into Chinese would be an excellent solution for web-based business and companies in the "eyeball economy" to catch the 19.31% internet population and directly increase the value of your websites. If your website is in English only, your market would be increased by almost 40% by our localization services. 103,000,000 internet users with US$3.99 (in average) monthly expenditure on internet game. For a fraction of cost, you can expend your market by 12.8% of the world market. 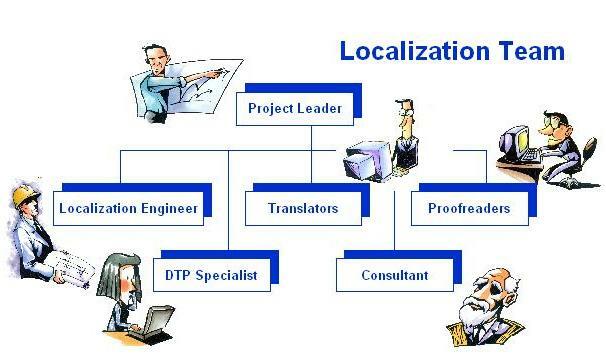 Our localization teams consist of a project leader who manages the project and evaluates the cost and schedule, a localization engineer who is responsible for technical coordination and completion of all localized software and website, DTP specialists who handle the DTP task, a group of translators and proofreaders. We also invite consultants from universities whenever necessary. Working in Group, our in-house localization team provides highest consistency with fastest feedback from proofreaders or clients, unlike other translation agencies which outsource their projects or hire freelance translators working separately. Only having the localized products, overseas company may found it difficult to enter a strange market. As your one stop localization service provider, we are glad to provide you with the following services. Of course, many other things should be taken into account for a specific project. Please contact us to discuss your specific needs and concerns. Copyright © 2005 Chinese-Version.. All rights reserved.